During the course of harvest, while the first fermentations were just getting under way, Alsace’s growers and winemakers had to bide their time. In spite of the chaotic climatic conditions that prevailed this year, quality and quantity are both spot on! We’ve seen the weather shift from periods of intense cold to extreme heat – and back again. Relatively damp conditions during flowering created the ideal conditions for the onset of downy mildew, with powdery mildew developing from July onwards. 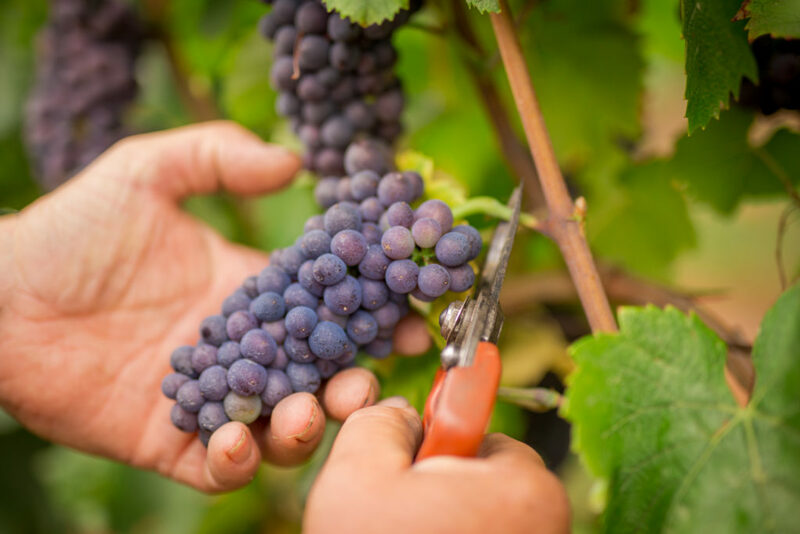 Even though there was a high risk of vineyards being struck by these diseases, the vigilance of local growers and the very warm temperatures of August helped to limit the damage. Depending on the area and the type of soil involved, these very warm conditions could have led to delays in ripening in some vineyards. Thankfully, the cooler weather we saw in September helped bring the grapes to full maturity in perfect health. 10 September for AOC Crémant d’Alsace [Note – should they not be referring to this as AOP now? ], for all grape varieties covered by the appellation’s regulations. 24 September for AOC Alsace and AOC Alsace Grands Crus, for all grape varieties within the appellation, apart from Riesling, whose harvest started on 27 September. NB It is worth noting that some areas decided to begin picking on different days. Grapes for the Vendanges Tardives and Sélections de Grains Nobles were picked by hand, as dictated by the appellation regulations, from the 8th October onwards. This applied to all grape varieties. The grapes for AOC Crémant d’Alsace were harvested in the best possible conditions and have already revealed great promise in terms of their potential to create still wines of great elegance and perfect balance. Yields were more or less what growers expected. One of the great successes of this vintage. Afterwards, the patience of Alsace’s growers was put to the test. The weather was changeable, with beautifully sunny days alternative with showers. All of this made planning the harvest very tricky as growers had to take into account various factors including ripeness levels, the risk of rot and the weather forecast. Can we compare this vintage to 2005? 2009? It’s too early to say. The possibility of predicting this vintage’s character will have to wait until the fermentations are over. Looking at each of the grape varieties in turn, attention should be drawn to the very great potential of all of the Pinots this year. Pinot Blanc is fresh and aromatic, Gris is very ripe, fruity and healthy and Noir is exceptional, with ripe, silky tannins and very deep, violet-tinged colour. The tannins and colour are due to elevated levels of anthocyanins and polyphenols, in comparison to the analyses of 2009. Muscats are fruity and fresh, as are the Sylvaners, The Gewurztraminers were harvested at optimal ripeness, and show great potential to achieve the kind of balance and depth of freshness, fruit flavours and spiciness that will make them great food wines. Riesling lagged behind the other varieties this year because its flowering in spring was spread out, and hydric stress shown in some areas delayed ripening even further. We will have to wait until fermentation is complete in order to get a picture of the potential of this grape in 2012. Bearing in mind the changeable weather conditions this year and concerns about disease, the volume of Vendanges Tardives and Sélections de Grains Nobles will be limited. The estimated volume of the 2012 harvest is in the region of 1,120,000 hectolitres, down a bit on the average over the course of the past five years. As a reminder, at 1,160,333 hectolitres, the 2011 harvest was generous, while that of 2010, at 911,951 hectolitres, was exceptional for its low yields.